We hear plenty in the news about the issue of obesity in America. 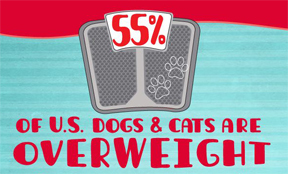 But did you know that 55% of dogs and cats are overweight? Ultimately, overweight pets can have a decreased life expectancy of 2.5 years, which is equivalent to 38 human years! We all need exercise on a daily basis and our pets are no different. Include you pet in your exercise routine and you’ll both be healthier for it! This entry was posted on Tuesday, May 27th, 2014 at 9:00 am	and is filed under Cat, Dog, News & Updates. You can follow any responses to this entry through the RSS 2.0 feed. Both comments and pings are currently closed.